HOW DO WE FIX OUR NHS? I have spent a lot of time over the last two months slowly bubbling up with indignation and fury at the woeful lack of continuity in my mother’s hospital care and trying to work out how we fix our NHS. She has been in three different NHS hospitals over that time, with no obvious end in sight, so it has been most fortuitous that I’ve just finished reading the book of the summer, “This Is Going To Hurt” by Adam Kay, the not-so-secret (anymore) diaries of a Junior Doctor, because he has reminded me that the NHS isn’t just made up of hospitals, pharmacies and GP surgeries all struggling with funding and red tape – it’s made up of the people who work there who are just trying to do their best under very difficult circumstances. So I’ve calmed down again. His book is full of laugh out loud diary entries that will not only make you cry with laughter, but reel with horror and feel heavy with sadness. It is one of the most honest descriptions of how hard our doctors have to work at the frontline of the NHS and it’s extremely readable. Two of my children are also loving it right now, although I fear it might put them off having babies, especially my daughter. 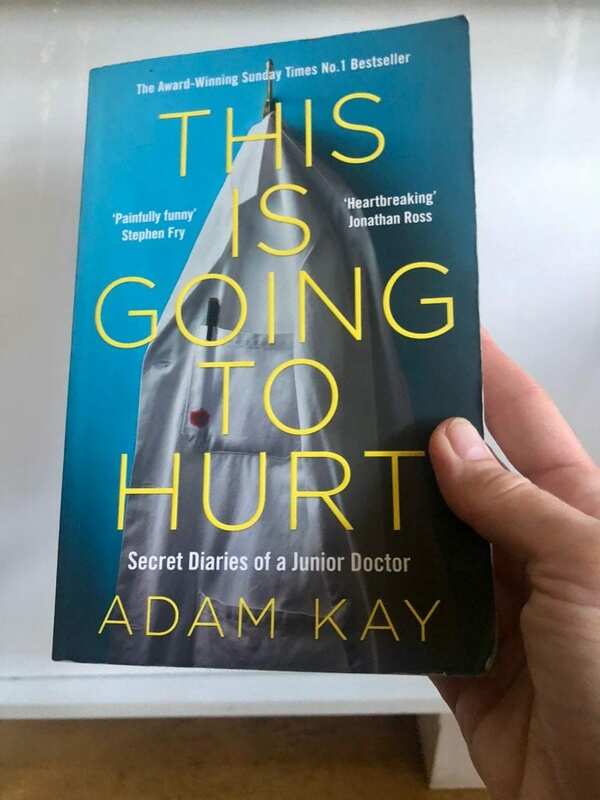 Despite the humour, Kay successfully weaves not only his passion for the failing monolith but an underlying warning throughout, about the ticking time bomb that is the NHS. He wrote it in response to the 2016 junior doctors dispute when the government started waging war on doctors and forcing them to work harder than ever for less money than ever and he says that “the government repeatedly lied that doctors were simply being greedy.” Of course we all know that’s not true and they are paid terribly for the hours they work. They lost that particular battle, but his suggestion is a plea for every healthcare professional to start shouting more loudly about the reality of their work so that the next time the health secretary lies that doctors are only in it for the money, we, the public will know just how ridiculous that is and stand alongside them in outrage. So his book is his call to arms (and legs and babies and blood, sweat and tears and everything else in-between that they have to deal with in their hospitals) and we must all heed his call. Of course we all love the NHS despite it’s limitations because when you’re being born or dying, it’s great…from cradle to grave and free at the point of service as Bevan promised back in 1948 remains the case, but that bit in the middle when you’ve got to sit around in not very clean hospitals for hours on end, or wait three months for your appointment? Not so much. Of course it does an amazing job and we all benefit from it. I’ve sat in waiting rooms for hours with family members; beads up my children’s noses, broken limbs, smashed up faces, shoulder operations, knee operations, back operations, cancer treatment for my father, smear tests, mammograms, X-rays, endless GP visits and fully admired all that they do under enormous pressures and stress, but that aside, it has become clear that the hours, the bureaucracy, the understaffing, the inconsistent messaging, the invisible consultants, the overworked staff, that it is no longer sustainable given how much longer we are all living and never going to survive unless we all agree to do something drastic. The NHS costs around £350 million a day to run. A DAY!!!. But it’s underfunded and running at a serious loss. It is also woefully under-resourced with fewer doctors and hospital beds than in many other European countries. Our government dares not touch it with a barge pole, because it is too sensitive and they know it would be electoral suicide as many of us are passionate about what it offers us. But we are being unrealistic. It is not sustainable and politicians are not the right people to solve the crisis. We don’t want what America has got because a lot of people get left behind, but how many people in the UK would not mind paying something to see a GP or a consultant? If we were offered the choice, would we pay for some things and not others? Would we agree to pay £10 every time we saw a GP if we could, like they do in Australia? The private health care in this country takes a huge amount of money from people and offers a smooth shiny service, your own room, nice pillows and great food, but if you are in real trouble what do they do? Call 999 and hope you get to an NHS unit designed to cope with a major emergency in time. Kay highlights the fact that in private medicine you get a mild upgrade on the NHS “but no huge difference in actual care” until it comes to infertility medicine, where the private sector is leagues ahead because the NHS requires you to fit into quite a narrow demographic in order to qualify for any treatment (including where you live) which he believes is totally wrong. Communication is key and my brother, who has worked in the NHS for 33 years now, suggests that the unified NHS computer system (which was previously commissioned but has so far failed) needs to be urgently reinstated so that key information about the patients don’t fall through the gaps. We all want to see the consultants, who also work extremely hard and can’t be expected to be on hand at all times, they have other teaching responsibilities and lives to lead, but perhaps there should be more senior staff available to ease the pressure. A massive overhaul is required and it’s going to need a team brave enough to take the bull by the horns and make some serious changes before it’s too late. Who is ready to step up?